Our park has 24 separate challenge elements on a self-guiding system. You can pick and choose which elements to tackle using your self-guided “smart belay” system connected to your harness that allows you to easily clip on to different routes. The overall course experience at Winter Park Adventure Quest takes between 60 and 90 minutes to enjoy. Your reservation allows for a full 90 minutes of course time. We ask you to arrive 20 minutes prior to your scheduled time. You’ll be given a brief safety orientation and get familiar with your gear, and then you’ll hit the course. WPAQ is the premier and only climbing guide service in the Winter Park area, offering guided rock climbing trips just minutes away in the Arapaho National Forest. No experience necessary — we offer challenges for beginner through advanced climbers. Our guided trips are great for a gym climber ready to experience the joys of real rock, a high-adrenaline date, a team-building experience, or an adventure for the whole family! Interested in learning new skills? Our experienced guides can cater the climbing experience to your needs, frequently teaching lessons in belaying, rappelling, knotcraft and climbing technique. After your climb, head back to the shop for a cold drink and a snack while taking in the incredible mountain views. Winter Park Adventure Quest is located at the Fraser Valley Sports Complex (5 minutes from the town of Winter Park), home to soccer and baseball fields, a pond, picnic amenities, restrooms, and an award-winning history-inspired playground celebrating our Western heritage. Plan to bring a picnic and stay awhile! 1 What is an aerial adventure park? 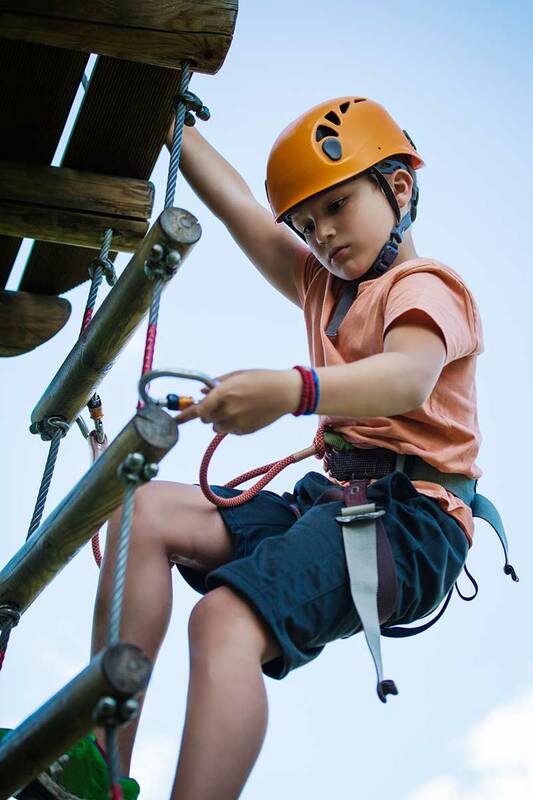 An aerial adventure park is a climbing adventure consisting of platforms fixed to utility poles with elements connecting each platform, such as swinging logs, rope bridges, cargo nets, and other fun challenge elements. Winter Park Adventure Quest also offers a 35-foot climbing tower experience, available separately or as a package with the park. 2 Are there age, height or weight restrictions? Standing flat-footed with arms extended above your head, you must be able to reach 6’; children who can reach 5’ may participate on the courses as long as they are accompanied by someone 16 or older. Maximum weight limit per person is 330 lbs. 3 What shape should I be in? Participants should be in good health and reasonably fit; the course is not recommended for pregnant women. 4 What about little kids? Children under 5 might enjoy our climbing tower (weight permitting), or the wonderful adjacent history-inspired playground right next to the park. We offer light concessions such as cold drinks and ice cream you can enjoy at the playground! 5 Do you offer special programs like programs for corporate bonding or team development, birthday parties, reunions? Yes! We can plan active and unique celebrations or curriculum for your group that will leave you with fresh-air memories and a feeling of exhilaration. Ask about our packages at info@wpadventurequest.com. 5 What is the admission price to the park? 6 Do you give a group rate? Discounts are available for groups of 8 or more. For group rates email info@wpadventurequest.com. 7 How safe are adventure parks? Our course was engineered and built by Adventure Experiences Inc., a company that specializes in building aerial adventure parks. Our course is inspected by the state and third-party inspectors annually to meet rigorous safety standards. We inspect our course and gear daily and weekly and our staff is specially trained by third-party ACCT-licensed trainers. We carry required insurance specific to the industry. All participants must wear helmets and full-body safety harnesses, and utilize a self-guided belay system that automatically locks to ensure safety. 1 What if I get scared or need to come down? Our staff is trained to assist you and/or perform rescues and guide you down if needed. There will be a staff member on each level of the course to provide assistance. 2 What happens if it rains? **We will issue rain checks and reschedule you for a full tour for closures due to lightning. 3 Do I need to sign a waiver? All participants must sign a waiver before entering the course. If you are under age 18, a parent or guardian must sign the waiver for you. 4 What type of clothing should I wear? Closed toe shoes, long hair tied back, comfortable pants or shorts. NO OPEN-TOED SANDALS OR FLIP FLOPS are allowed for safety reasons. 5 Can I just show up or do I need a reservation? We strongly recommend you book prior to arriving, as the park has limited capacity and we may not be able to accommodate you without a reservation. Make your reservation quickly and easily online. **Due to high scheduling demand, after 48 hours your booking is non-refundable. 7 When should I arrive? Please arrive 20 minutes prior to your reserved time so we can get you outfitted and ready to climb. 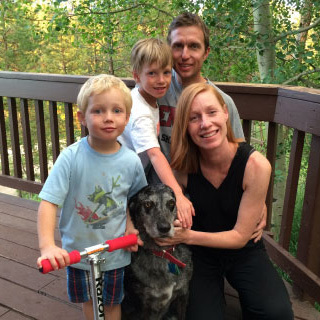 Winter Park Adventure Quest is a family-owned local business and the dream of Igor Guziur. Growing up in the mountains of the Czech Republic, Igor was on skis before he could walk. He played competitive hockey for 10 years, going on to receive a masters degree in physical education. After working as a ski instructor in the Austrian Alps, Igor came to Winter Park, working as the Nordic Center Director at Snow Mountain Ranch and Activities Director at Devil’s Thumb Ranch, where he operated one of the largest zip lines in the state and the West’s premier Nordic Center. His active childhood in the Czech countryside inspired Igor to create an experience like those in Europe—one that caters to families and provides fun and approachable outdoor adventure for everyone. When he’s not skiing, Igor loves playing hockey, mountain and road biking, climbing, and taking road trips in his old blue pickup truck with his wife, Cara, and sons Alek and Kieran. Rock Climbing Tours available daily (Advanced reservation suggested). Ask about booking the course for your next birthday party, happy hour, reunion, bridal party bonding, and more! From Winter Park: Take Highway 40 north past the town of Fraser one mile; turn left on County Road 5 and take your first right into the Fraser Valley Sports Complex. Parking is located near the large covered ice arena and the playground. Experience Rafting & Side by Sides in the Rocky Mountains! Class I to Class IV rafting trips for friends, family, and group outings in the Colorado Mountains. Explore the vast terrain in Winter Parks Arapahoe National Forest with our Continental Divide Tour.